Nipsey Hussle at a basketball court refurbishment in October in L.A. 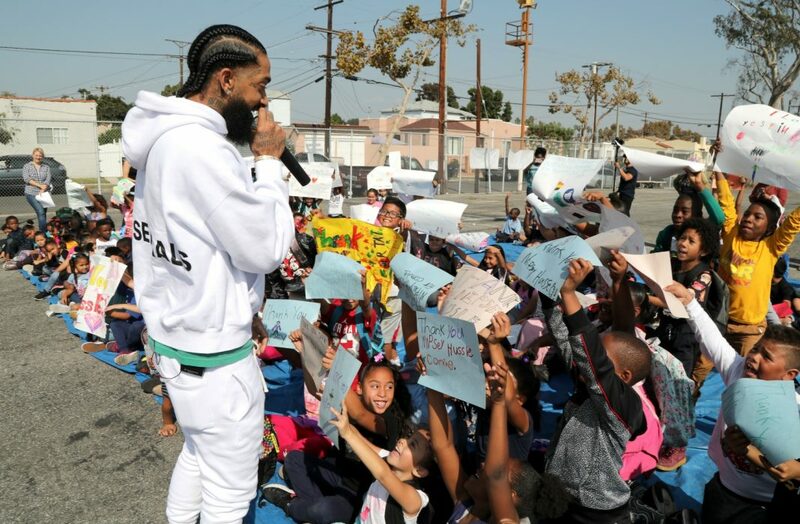 The city of Los Angeles has been in mourning since 33-year-old rapper and South L.A. advocate Nipsey Hussle was gunned down on March 31, just outside his store, the Marathon Clothing in Hyde Park. Actress Lauren London, Hussle’s partner and mother of their 2-year-old son Kross Asghedom, acknowledged L.A.’s pain over the loss of Nip (the nickname by which his family, friends, and fans fondly referred to him). While thousands of fans lined up as early as 7 a.m. for the event, others somberly lingered outside of the arena wearing blue clothing, and selling blue roses and T-shirts with Hussle’s words and image. Others burned incense in honor of Hussle, handing it out while Hussle’s music continued to blare out of portable speakers as people prepared to say their final goodbyes. In the midst of it all, we spoke to fans about the impact that Hussle had on their lives and in their community.